Richard Parkes Bonington (December 25, 1802 - September 28, 1828) was an English Romantic landscape painter. Richard Parkes Bonington was born in the town of Arnold, a suburb of Nottingham in England. His father was successively a gaoler, a drawing master and lace-maker, and his mother a teacher. 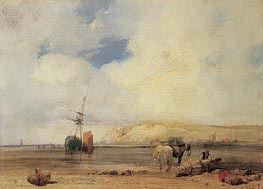 Bonington learned watercolour painting from his father and exhibited paintings at the Liverpool Academy at age 11. 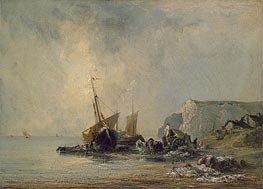 In 1817, Bonington's family moved to Calais, France where his father had set up a lace factory. 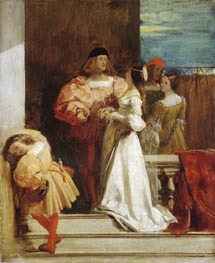 At this time, Bonington started taking lessons from the painter François Louis Thomas Francia, who trained him in English watercolour painting. In 1818, the family moved to Paris to open a lace retail outlet. It was Paris where he first met Eugène Delacroix, who he became friends with. He worked for a time producing copies of Dutch and Flemish landscapes in the Louvre. In 1820, he started attending the École des Beaux-Arts in Paris, where he studied under Antoine-Jean, Baron Gros. It was around this time that Bonington started going on sketching tours in the suburbs of Paris and the surrounding countryside. His first paintings were exhibited at the Paris Salon in 1822. He also began to work in lithography, illustrating Baron Taylor’s "Voyages pittoresques dans l'ancienne France" and his own architectural series "Restes et Fragmens". In 1824, he won a gold medal at the Paris Salon along with John Constable and Anthony van Dyke Copley Fielding. Bonington died of tuberculosis on September 28, 1828 at 29 Tottenham Street in London, only 26 years old.